Meet Jonas and find out about his role at Manchester Airport. My name is Jonas, I have worked at MAG for just over a year and I love every minute! Working for MAG is amazing, MAG provides fantastic careers opportunities in many different fields from IT to Lounge Chefs just like me. What qualities are most beneficial to becoming a Lounge Chef? 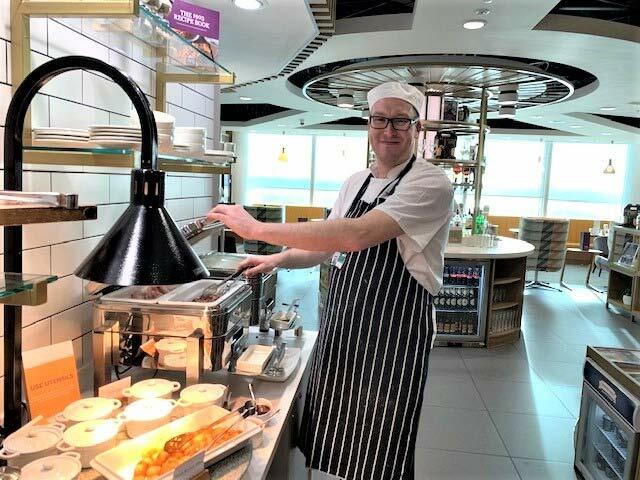 As a Lounge Chef you need to work with different colleagues across the Lounge business, excellent customer service, attention to detail and working as a team is essential. What advice would you give to anyone thinking of becoming a Chef? Being a Chef is a rewarding career, however, you have to be passionate about food, keep the kitchen clean and tidy, be ready to work long hours, work under pressure and multitask as well as being creative. In 1903 we offer a more individually styled buffet service and I love the flexibility to choose what is going on the menu each day, to provide variety for our guests. Our guests come from all over the world and it’s great to see them enjoying the food we make. I also love being part of an amazing team and working together to create something fantastic!